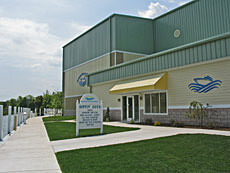 Cheboygan Village Marina is located on the Cheboygan River just 1/4 mile upstream from the Straits of Mackinac and Lake Huron. Within minutes, you can be on big water, heading out to any number of destination points. 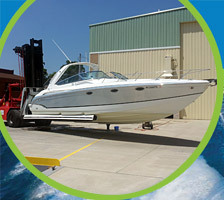 This is the only marina offering heated dry stack storage in Northern Michigan on the Great Lakes with in/out valet service. Cheboygan Village Marina is situated right smack in the middle of what is arguably, the best location for freshwater boating anywhere. Period! Just minutes from I75, allowing easy access to/from cities all over Michigan. On Main Street in a quaint all-American town with museums, great restaurants, Opera House, an art gallery, free music concerts - all within walking distance of the marina - not to mention the friendly people of Cheboygan. 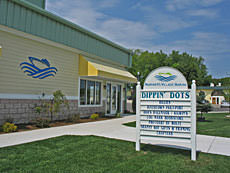 Right next to the Cheboygan Area Chamber of Commerce office and park which provides access to the over-river pedestrian walkway linking the East and West sides of the town. Stop in and check out our Summer In/Out Valet Service, Winter Heated Storage, and amenities including free wireless internet, all new, clean restrooms, showers, and laundry facility.